It is with real sadness that we announce the death of longstanding friend of AE, Prof. Calvin Cook, who went to be with our Lord this December. Below are a few words from Michael Cassidy in tribute of Calvin. Over many years, and to a good many people, I have said, “I can’t imagine a world without Calvin Cook”. Calvin, as one of the dearest, wisest, saintliest and most treasured friends I have known, had become such a giant and pervasive presence in my life that I could not think of life without him. Sadly, I will now have to. I, on behalf of my wife Carol and my whole family, and Miles Giljam, the leader of African Enterprise, South Africa, and our AE ministry around Africa and the world, would like to extend to Pat, Calvin’s wife, and the whole family our deepest possible sympathy, love and prayers at this time. I feel so privileged that Calvin, a couple of years ago, asked that I would share at his funeral which was held on the 30 December last year. So where and how does one start to share about the life and influence of such a man? For me, and I suspect for all of us that knew Calvin, it has to begin and end with gratitude and thanksgiving for one of the finest, saintliest and most authentically Christian lives any of us are ever likely to know. We can say, as St. Paul said to the Philippians, and of the Philippians, “I thank my God upon every remembrance of you.” And I especially, as the founder of African Enterprise, can add Paul’s next words, when he said to the Philippians, “because of your partnership with me in the Gospel from the first day until now” which for Calvin and I started in 1961 and ended in his death. So what are the things that one would most especially thank the Lord for in terms of Calvin’s life and ministry? I think first of all for me, and for all who knew him, in Christian ministry particularly, he stood as an “Exhibit A” Christian and a true man of God. If one wanted to know what the true Christian life and character were all about, one could look at Calvin Cook and see it personalised and epitomised. And I knew Calvin well, over a 50 year span of friendship in 101 different contexts. From church contexts, Christian conferences, African Enterprise board meetings, multiple mentoring sessions through to once a month lunches in Howick with him and Pat, and in recent years in hundreds of other social situations. We also had our regular TV rugby sessions when we were both trying to pray the Springboks through to victory – a serious test for the sanctification of even the most committed Calvinist! And I don’t think in all of those situations I ever saw Calvin manifest an ungodly reaction or an unchristian attitude. Even when referee Bryce Lawrence began playing for the Wallabies half way through the quarter final of the recent World Cup! Calvin would keep his grace. Again and again, I marvelled at his capacity to bring a truly Christian, biblical, Godly, forgiving and loving attitude to every situation. In fact, and I’ve thought about this in a fairly considered way, I think Calvin was probably the single saintliest person I have ever known and I think Pat, that you and Calvin together were the saintliest Christian pair, husband and wife, that has ever been my privilege to know. Pat, I want to say that your example as a married couple and as parents was totally inspirational and exemplary for Carol and I. In this regard I also want to thank God for Calvin as a man of the Bible and of the Gospel. Calvin brought every issue of life, thought, faith and reflection, moral behaviour and Christian ministry to the touch stone of Scripture. “The Bible say it, I believe it, that settles it”, was how he viewed the Bible as the Word of God. Scripture was decisive for Calvin, in all matters of faith and morals, though his approach was not obscurantist nor simplistic because he was a scholar and a theologian of note, and an intellectual of brilliance with a mind-bending memory and an encyclopaedic grasp of Church history. Even at my last meeting with Calvin just a couple of weeks ago, we were talking about the 18th century preacher in America, great Revivalist and thinker Jonathan Edwards, and I was astounded at his grasp of Edwards’ life, significance and teachings. Calvin brought to the Scripture, even to the simplest proclamation and declaration of the Gospel, the acumen of a brilliant theologian, a superb historian and a very capable exegete and a passionate evangelist, who wanted above all to see people come to know Jesus Christ and put their faith in him as Saviour and Lord. Calvin was also, and for this I thank the Lord, a true man of the Church. By that I mean the visible corporate structure of the worshipping body of Christ. I think the Presbyterian church of South Africa was uniquely privileged to have Calvin as one of its favourite sons, key figures and distinguished leaders. But Calvin’s church commitments were not just to its corporate structure. He was equally committed to its local expression in the local and parish church, and he was a wonderful pastor and shepherd. It was in this capacity that I first met Calvin in August 1961 when I came to Pietermaritzburg and had the privilege of preaching in his church. As a man of the church he was also a man for unity. Unity at a national level as well as in the local church, and we worked together on the South African Congress on Mission and Evangelism in 1973 when we drew together most of the leadership of the South African Church. Calvin gave an amazing and prophetic utterance on the South African Church using the duck billed platypus as his major analogy! And then of course he also made a great contribution at an international level in the ecumenical movement. Then of course, for Calvin to be a person of unity and to bring people together like that, he had to also be a man of the Spirit. Now for Calvin the Holy Spirit was not the forgotten person of the Trinity but the centrally experienced power for daily life and witness. In the 70’s when the Renewal Movement burst upon South Africa, Calvin and Pat were in there, boots and all, exploring and appropriating and giving a lead in terms of the person, work, fruit and gifting of the Holy Spirit. And he was a man of the Spirit till the very, very end of his days. All I can say about that is ‘Deo Gloria’ and ‘Gloria in Excelsis’. Then perhaps as I close, I would want to say a bit about what Calvin was to me personally, and very particularly I want to declare that he was the Father of the African Enterprise ministry in Africa, and in South Africa, and its chief architect, counsellor and advisor. Calvin was perhaps the one person in South Africa and Africa about whom I can use Paul’s words to Philippians with real exactness when he said, “I thank my God on every remembrance of you, always in every prayer of mine for you, making my prayer with joy, thankful in the partnership in the Gospel from the first day until now.” And Paul says, “I’m thankful that he who began a good work in you will bring it to completion at the day of Jesus Christ”, and that indeed is exactly what he did. It was Calvin who opened up for us at our very first mission held in Pietermaritzburg in August 1962. A year before that, in 1961, he had gone to the Minister’s Fraternal, who were considering some ‘big cheeses’ from around the world to lead the city-wide mission, and said, “I believe the time has come”, as he put it, “for the church of Pietermaritzburg to take a major risk, and invite Michael and his little team”. We had never done anything before, and we were invited to come for what turned out to be quite an historic endeavour. Fifty years have since passed, and this coming year we will be celebrating our anniversary with another mission to Pietermaritzburg. Miles Giljam, our leader in South Africa, says he hopes and prays that it will be a sufficiently wonderful experience to be in memory and tribute to Calvin. 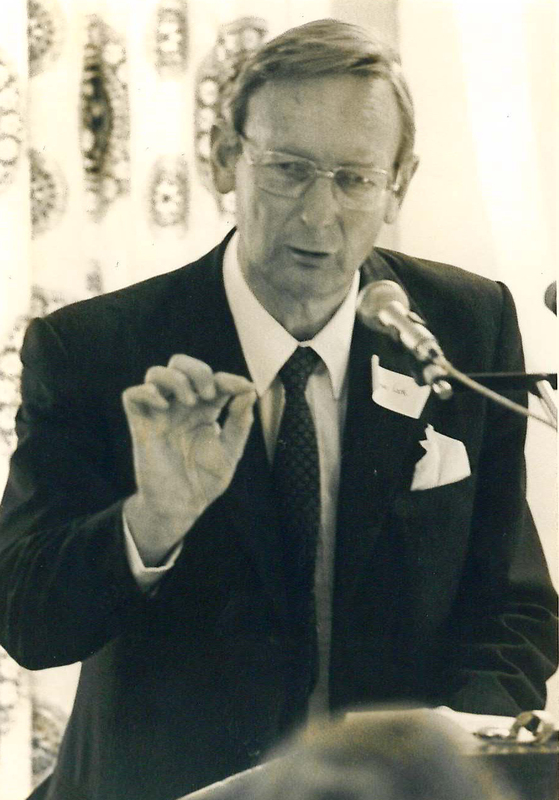 From the ‘Maritzburg Mission, Calvin then opened up the Wits Mission in ’67 when he was a lecturer there, then the Johannesburg Mission, 300 churches for one year in 1970, and then the Rhodes Mission in 1972. From then on AE was launched. It could never have been launched but for Calvin Cook and I give praise for that. He served on our board of directors right up until just a couple of years ago. I would like to mention that to me he was a friend, a mentor and advisor of consummate value, and I absolutely treasure everything that he was. I am going to miss the teas and the lunches out with you guys, Pat, and the rugby matches and then the post-rugby suppers at our house when we would analyse the game and see who the really bad guys were. I will miss the endless conversations as he mentored me in theology, spirituality, Christian life, missiology and evangelism. It’s hard for me to think of not actually being able to say to Carol, or to say to myself or to the Lord, “I must go and check what Calvin would think about this”. And so it is a huge emotional, spiritual hole left in my life, not comparable of course to the gap left in the lives Pat, and family. That is what Calvin is, and for us who remain, we all now say, and will always say, that we thank our God upon every remembrance of Calvin Cook.